In this is a totally candid picture taken of the bride and groom walking back up the stairs to the old mansion at Vizacaya. The bride had a really long train to her dress and along veil too. So when I saw them start to go up the stairs the flow of her dress and veil just looked to perfect on to take the photo. We were just out for about forty minutes doing first look, portraits and bridal party pics on a super hot summer day. The couple was more than happy to go back inside and cool off before the start of their ceremony. Vizacaya Sacramento is one of the premier wedding and event venues of the city. The property is located in downtown Sacramento and is easy to get to from the freeways and city hotels. It’s grounds are stunning with historical mansion that is the getting ready area from the girls and guys. The bride and her bridesmaids have access to the middle floor parlor and back room salon. While the groom and his groomsmen will be stored away downstairs in the basement, which has been turned into a giant man cave. This will keep the men occupied for sure. Behind the mansion is the back courtyard where all the outdoor ceremonies will take place. They are able to handle indoor weddings and those take place right next door at the elegant pavilion. The giant pavilion is where your reception will be taking place at. You will enjoy your dinner, speeches, dancing and all of your guest on your wedding night. Your cocktail hour will take place on the back patio of the pavilion. Everything is with in a super short walking distance. In between the mansion, courtyard and pavilion are immaculate gardens. These locations are great for photos and staying in the shade during the hot summer months. 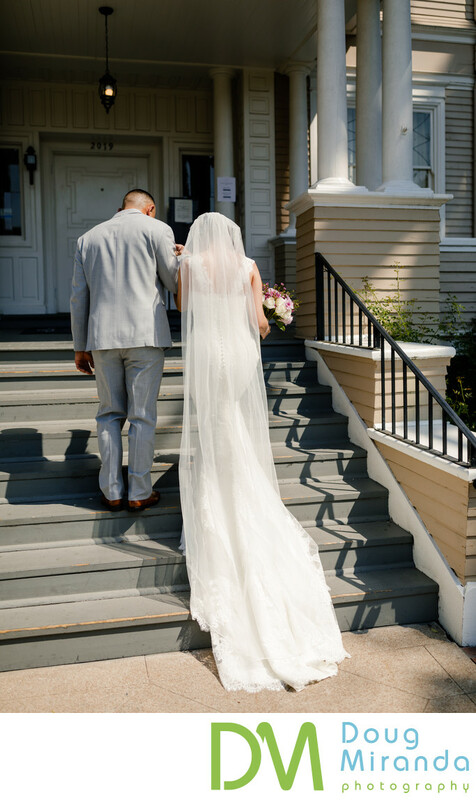 Out front of the pavilion your guest are greeted by two large stone staircase and their trademark fountain.They have been making wedding dreams come true over the past 20 years. Here’s a list of unique services that Vizacaya offers for each event. Getting ready rooms and lounge for bride and groom. Complete set up and breakdown of event. Tables, white chairs, linens and a dance floor. Complete drink service with no corkage fees. Award winning food for dinner, appetizers and any food services. Here is a wedding vendor list that the couple used on their day. Wedding venue & catering, Vizacaya Sacramento, 2019 21st St, Sacramento, CA 95818. Wedding design, decorations and flowers, NC Event Designs. Photo booth, The Photo Spot, Elk Grove, CA. DJ & Lighting, Beat Fleet DJs, Jerry Litell Way, Sacramento, CA 95835. Videography, Cinecrown, 1015 25th St, Sacramento, CA 95816. Photographer, Doug Miranda Photography, 1017 L St #791, Sacramento, CA 95814. Donuts, Donut Star, 93 W Court St, Woodland, CA 95695. Wedding Cake: Ettore’s Bakery & Cafe, 2376 Fair Oaks Blvd, Sacramento, CA 95825. Location: 2019 21st St, Sacramento, CA 95818.